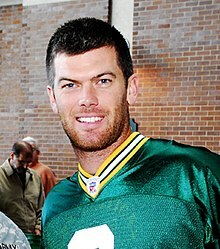 Mason Walker Crosby (born September 3, 1984) is an American football placekicker for the Green Bay Packers of the National Football League (NFL). He played college football for the University of Colorado, and earned unanimous All-American honors. The Packers chose him in the sixth round of the 2007 NFL Draft, and he was a member of the Packers' Super Bowl XLV championship team against the Pittsburgh Steelers. Crosby attended the University of Colorado Boulder, where he played on the Colorado Buffaloes football team from 2003 to 2006. While enrolled at Colorado, he displayed extraordinary leg strength, making a school-record 60-yard field goal against Iowa State in 2004. Crosby’s 58-yard field goal against Miami in 2005 was the longest ever kicked in NCAA Division I-A football at sea-level without a tee. In all, Crosby holds 31 school records. Crosby connected on 66 of 88 field goals in total during his college career, and 30 of 34 inside 40 yards. He developed a reputation for kicking in the clutch, making 12 of 13 field goals in the fourth quarter, and a perfect 10/10 in the final 8½ minutes of games. This bent was most evident when Crosby played rival Colorado State University, against which Crosby made kicks of 55 (2004), 48, and 47 yards (2005) in consecutive years to win the Rocky Mountain Showdown. Crosby also served as the Buffaloes' kickoff specialist, where his knack for forcing touchbacks after touchdowns made him a fan favorite. Overall, 138 of Crosby's 203 career kickoffs were touchbacks, including an 87-yard kickoff touchback from the 20-yard line against Iowa State in 2004. The Sporting News named Crosby to its All-Decade team for the first nine years of the 2000s (decade). Crosby was a first-team All-Big 12 selection in 2004, 2005, and 2006. Following his junior season in 2005, he was recognized as a unanimous first-team All-American, having received first-team honors from the Associated Press, the Football Writers Association of America, The Sporting News, and Walter Camp Football Foundation. As a senior, he was again selected as a first-team All-American by Pro Football Weekly and the Walter Camp Football Foundation. He was the runner-up for the Lou Groza Award, despite being heavily favored to win. During his senior season, he became the first player in Big 12 Conference history to be named player of the week eight times, and became Colorado's all-time leading scorer, with 308 career points. Crosby was chosen by the Green Bay Packers in the sixth round (193rd overall) of the 2007 NFL Draft, the last of three consecutive picks for the Packers, and the third kicker overall. Crosby entered training camp in a battle with incumbent placekicker Dave Rayner. During Green Bay's first pre-season game against the Pittsburgh Steelers, Crosby kicked a 52-yard field goal, the longest field goal in the history of Heinz Field. Crosby won the starting job during the final roster cut. In his first regular season game, Crosby converted all three field goals he attempted, including a 53-yarder and a 42-yard kick with two seconds left on the clock to help the Packers defeat the visiting Philadelphia Eagles. The kick was the first game-winner by a rookie on opening weekend since 1979 (when Matt Bahr achieved the same feat). Crosby was the first player in NFL history to kick a 50-yard field goal and a game-winning field goal with under a minute remaining in his NFL debut. Crosby was named NFC Special Teams Player of the Week (the first rookie kicker to receive this honor on opening weekend). Crosby was awarded the NFC Special Teams Player of the Month for November 2007. He led all NFL kickers with 54 points and tied for the lead with 12 field goals as the Packers posted a 4-1 mark. Crosby converted 12 of 15 field goals during November and was a perfect 18-for-18 on PATs. He had at least one field goal in every game, including four in the Week 9 win at Kansas City. His longest field goal of the month was a 52-yarder in the Week 13 contest at Dallas. For the 2007 season, Crosby led the NFL with 130 points scored and his 24 field goals ranked first in the NFC. Crosby finished second for most points scored in a season by a rookie (Kevin Butler had 144 points for Chicago in 1985). Crosby finished 2007 with the highest-scoring season by a kicker in franchise history and third-highest season point total by any Packers player. In the first game of the 2010 regular season against the Eagles, Crosby kicked a field goal from 56 yards in the last seconds of the first half, his career long and a franchise record. At the end of the 2010 season, Crosby and the Packers appeared in Super Bowl XLV against the Steelers. In the 31–25 victory, he converted all four extra point attempts and his only field goal attempt. On July 27, 2011, the Packers re-signed Crosby to a 5-year, $14 million deal. Crosby kicked four field goals in a game on three separate occasions, which were October 9, 2011 (Atlanta Falcons), October 23, 2011 (Minnesota Vikings), and December 11, 2011 (Oakland Raiders). On October 2, 2011, Crosby kicked a season-high 7 PATs against the Denver Broncos. On October 23, 2011, Crosby set the franchise record when he made a 58-yard field goal in the third quarter as part of a four-field-goal game. He also was good from 39, 45, and 24 yards and made all 15 of his field goals through week 9. He equaled his record distance on a 56-yard field goal on October 9, 2011, in the third quarter against the Atlanta Falcons. He finished the 2011 season converting 68-of-69 extra point attempts and 24-of 28 field goal attempts. The Packers' season ended in the Divisional Round against the New York Giants. In the 37–20 loss, he converted both extra point attempts and both field goal attempts. Crosby kicked three field goals a game at the most all season, on 3 separate occasions, September 13, 2012 (Chicago Bears), October 21, 2012 (St. Louis Rams), and December 2, 2012 (Minnesota Vikings). On December 23, 2012, Crosby kicked a season-high 7 PATs against the Tennessee Titans. On September 14, 2012, Crosby kicked a season-long 54 yard field goal against the Chicago Bears. In 2012, he finished with a 63.6 field-goal percentage. This was the lowest field goal percentage for any active kicker in the league in the 2012 season. On September 15, 2013, Crosby kicked a season-high five PATs against the Washington Redskins. On October 27, 2013, Crosby tied his season-high 5 PATs against the Minnesota Vikings as well. On October 6, 2013, Crosby kicked a season-high 5 field goals against the Detroit Lions. On November 17, 2013, Crosby kicked a season-long 57-yard field goal against the New York Giants. On December 15, 2013, Crosby tied his season-long 57-yard field goal against the Dallas Cowboys. Crosby kicked 33 field goals in the 2013 season, tying the franchise single-season record with Ryan Longwell and Chester Marcol. On September 14, 2014, Crosby kicked a season-long 55-yard field goal against the New York Jets. On November 9, 2014, Crosby kicked a season-high 7 PATs against the Chicago Bears. Crosby kicked 27 field goals in the 2014 season, which is the 5th most in franchise history. On January 18, 2015, in the NFC Championship game, Crosby kicked a season-high 5 field goals against the Seattle Seahawks, including a 48 yarder to force overtime. However, Seattle scored a touchdown which ended the Packers season. On September 20, 2015, Crosby broke Ryan Longwell's team career scoring record of 1,054 with his fourth field goal of the game against the Seattle Seahawks. He is now the all-time leading scorer in Packers' history. On September 28, 2015, Crosby kicked a season-high five PATs against the Kansas City Chiefs. On November 1, 2015, Crosby kicked a season-long 56-yard field goal against the Denver Broncos. On November 22, 2015, Crosby kicked a season-high 5 field goals against the Minnesota Vikings. On January 3, 2016, Crosby recorded a forced fumble against the Minnesota Vikings. On March 1, 2016, Crosby signed a four-year contract extension with the Packers. On January 15, 2017, Crosby kicked three field goals, of 56 and two of 51 yards (one of which did not count), in the final two minutes of the Packers' 34–31 second-round NFC divisional playoff win against the Dallas Cowboys. The first 51 yarder was invalidate due to a Cowboys timeout called in a process called icing the kicker. Crosby kicked the second 51 yard attempt for the win as time expired, marking the first time a kicker made two 50+ yard field goals in the final two minutes of a postseason game. He also converted his 20th consecutive field goal in the post season, surpassing David Akers's previous record of 19. Crosby completed the 2017 season with the Packers, maintaining a 78.9% Field Goal completion percentage, his lowest since 2010. Crosby also accomplished a 94.3% extra point completion percentage, the second lowest of his career. The Packers had been suffering difficulties with the longsnapper position and holder responsibilities changed hands several times throughout the year. The search for a longsnapper and reliable holder led to several missed field goals and two missed extra points. During a Week 10 matchup against the Chicago Bears, Crosby missed a 35 yard field goal off of an off-line snap that was then mishandled by rookie holder and punter Justin Vogel. After that game, Crosby only missed one more kick for the rest of the season, a would-be record at Heinz Field of 57 yards. Due to the Packers' loss of Aaron Rodgers for most of the season, defensive difficulties, and special teams miscues, 2017 would be only the second year Crosby had not played in playoff game in his 10 year NFL career. In a Week 2 tie against the Minnesota Vikings, Crosby made what appeared to be the game-winning field goal at the end of regulation. However, the Vikings called a timeout just before the attempt to "ice the kicker", and Crosby missed the second attempt sending the game into overtime and an eventual tie. In Week 5, Crosby was 1–5 on field goals and also missed his only extra point attempt, becoming the first player since Kris Brown in 2001 to miss 4 field goals in a single game and just the fourth player in NFL history to miss 4+ field goals and an extra point in a game. Crosby bounced back the following week, converting all three extra point attempts and all four field goal attempts, including a 27-yard game winner as time expired in a 33–30 win over the San Francisco 49ers, earning him NFC Special Teams Player of the Week. Crosby talking to the press. Crosby graduated in December 2006 from the University of Colorado, majoring in communication. He attended Georgetown High School in Texas, where he played football and soccer. He is a Houston Astros fan and an avid golfer. Mason's father, Jim, was a running back in college for the UTEP Miners and graduated from Texas Tech. Crosby married Molly (née Ackerman) on June 28, 2008. They have five children including: son Nolan James (born August 2010) and daughter Charlotte (born May 2013). Crosby is a Christian. Crosby has spoken about his faith by saying, "I think He helps me knowing that kicking is what I do, not who I am. It's not everything that I am. I can escape knowing that my relationship with Christ is what carries me. I'm always reading in the Proverbs and Psalms to relax my mind before we play. I know that God cares for me all the time regardless of any outcome here." ^ a b "2005 Colorado Football – Game 13 – Clemson" (PDF). University of Colorado. Archived from the original (PDF) on June 6, 2011. Retrieved October 21, 2006. ^ "Colorado State at Colorado Box Score, September 4, 2004". College Football at Sports-Reference.com. Retrieved August 17, 2018. ^ "Colorado State at Colorado Box Score, September 3, 2005". College Football at Sports-Reference.com. Retrieved August 17, 2018. ^ "2009 Colorado Football – Game 4 – West Virginia Mountaineers" (PDF). University of Colorado. Archived from the original (PDF) on June 6, 2011. Retrieved September 30, 2009. ^ David Plati (December 7, 2006). "Crosby Named Walter Camp All-American". CUBuffs.com. Retrieved December 8, 2006. ^ "Big 12 Conference Records" (PDF). CSTV. Retrieved October 21, 2006. ^ "2007 Green Bay Packers Draftees". Pro-Football-Reference.com. Retrieved August 17, 2018. ^ "Packers: Consistent Crosby keeps on course". Madison.com. Archived from the original on February 23, 2011. Retrieved December 29, 2007. ^ "AFC/NFC Players of the Week". Archived from the original on October 29, 2007. Retrieved September 13, 2007. ^ Cohen, Robert W. (September 1, 2018). The 50 Greatest Players in Green Bay Packers History. Rowman & Littlefield. ISBN 9781493031894. ^ "Mason Crosby Named NFC Special Teams Player Of The Month". Archived from the original on December 13, 2007. Retrieved December 9, 2007. ^ "Super Bowl XLV – Pittsburgh Steelers vs. Green Bay Packers – February 6th, 2011". Pro-Football-Reference.com. Retrieved December 15, 2017. ^ a b "Mason Crosby: Game Logs at NFL.com". nfl.com. Retrieved February 7, 2016. ^ "Broncos vs. Packers – Box Score – October 2, 2011 – ESPN". ESPN.com. Retrieved February 7, 2016. ^ "Crosby, Masthay put on kicking clinic". Packersnews.com. Archived from the original on September 2, 2013. Retrieved November 19, 2012. ^ Odum, Charles. "Falcons start fast but fall to Packers, 25–14". San Diego Union Tribune. Retrieved August 17, 2018. ^ "Mason Crosby 2011 Game Log". Pro-Football-Reference.com. Retrieved August 17, 2018. ^ "Divisional Round – New York Giants at Green Bay Packers – January 15th, 2012". Pro-Football-Reference.com. Retrieved August 17, 2018. ^ "NFL playoffs 2012: New York Giants stun Green Bay Packers, 37–20". Washington Post. Retrieved August 17, 2018. ^ "Titans vs. Packers – Box Score – December 23, 2012 – ESPN". ESPN.com. Retrieved February 7, 2016. ^ "Bears vs. Packers – Box Score – September 13, 2012 – ESPN". ESPN.com. Retrieved February 7, 2016. ^ "NFL Player Kicking Statistics – 2012". ESPN. Retrieved March 10, 2013. ^ "Redskins vs. Packers – Box Score – September 15, 2013 – ESPN". ESPN.com. Retrieved February 7, 2016. ^ "Packers vs. Vikings – Box Score – October 27, 2013 – ESPN". ESPN.com. Retrieved February 7, 2016. ^ "Lions vs. Packers – Box Score – October 6, 2013 – ESPN". ESPN.com. Retrieved February 7, 2016. ^ "Packers vs. Giants – Box Score – November 17, 2013 – ESPN". ESPN.com. Retrieved February 7, 2016. ^ "Packers vs. Cowboys – Box Score – December 15, 2013 – ESPN". ESPN.com. Retrieved February 7, 2016. ^ a b "Green Bay Packers Single-season Kicking & Punting Leaders | Pro-Football-Reference.com". Pro-Football-Reference.com. Retrieved February 7, 2016. ^ "Jets vs. Packers – Box Score – September 14, 2014 – ESPN". ESPN.com. Retrieved February 6, 2016. ^ "Bears vs. Packers – Box Score – November 9, 2014 – ESPN". ESPN.com. Retrieved February 6, 2016. ^ "Packers vs. Seahawks – Box Score – January 18, 2015 – ESPN". ESPN.com. Retrieved February 6, 2016. ^ "Crosby surpasses Longwell as franchise career scoring leader". Packers.com. Retrieved September 21, 2015. ^ "Chiefs vs. Packers – Box Score – September 28, 2015 – ESPN". ESPN.com. Retrieved February 6, 2016. ^ "Packers vs. Broncos – Box Score – November 1, 2015 – ESPN". ESPN.com. Retrieved February 6, 2016. ^ "Packers vs. Vikings – Box Score – November 22, 2015 – ESPN". ESPN.com. Retrieved February 6, 2016. ^ "Packers K Crosby forces fumble during kick return". www.packers.com. Retrieved February 6, 2016. ^ "Mason Crosby signs four-year contract with Packers". NFL.com. March 1, 2016. ^ "Green Bay at Dallas / 2017-01-15 / National Football League / Yahoo! Sports</title>". yahoo.com. January 15, 2017. ^ "Mason Crosby's Performance Was Most Clutch by Kicker in Postseason History". ESPN. Retrieved January 19, 2017. ^ "Crosby sets mark for consecutive playoff FGs". ESPN.com. Retrieved January 17, 2016. ^ "Packers turn to third long snapper of the season: Derek Hart". ESPN.com. Retrieved October 5, 2018. ^ "Packers' long-snapper saga comes full circle with return of Brett Goode". ESPN.com. Retrieved October 5, 2018. ^ "Mason Crosby". ESPN.com. Retrieved October 5, 2018. ^ "Packers, Vikings settle for OT tie, 29–29". www.packers.com. Retrieved September 23, 2018. ^ "NFL reacts to Mason Crosby's meltdown vs. Lions". Green Bay Packers. ^ "Players who missed 4+ field goals in a game". pro-football-reference.com. Retrieved October 8, 2018. ^ Lam, Quang M. (October 17, 2018). "Albert Wilson, Todd Gurley among Players of Week". NFL.com. ^ "Kicker Crosby earns NFC weekly honor and had the most points in the NFL his rookie season". Retrieved September 13, 2007. ^ a b "Crosby wins second weekly award of 2011". Retrieved October 26, 2011. ^ "SUPER BOWL: Aaron Rodgers, other Packers, looking to 'follow Jesus' example'". Archived from the original on January 6, 2014. Wikimedia Commons has media related to Mason Crosby.